Across society, we are witnessing a redefinition of individual success in a more holistic way. I see it firsthand in my travels and experience it in my conversations. This new definition includes financial security, but also personal safety, a sense of purpose and a connection to community. Let me explain. We know personal safety is crucial to a sense of well-being. Feeling secure in your home and community is something we should never take for granted. But what about a sense of purpose and connection to community? In recent times, people overlooked these themes. Many believed (and still do) that money predominantly drove happiness – and while financial success is important, it’s far from everything. People need more. They need to know that their lives have meaning—that when they get up in the morning, the result at the end of the day will be a better self, a better family or a better community. The opportunity to advance and make progress brings satisfaction. Purpose is a current buzzword in business circles, and leaders are realizing that consumers favor companies that are responsible, caring and give back. As a lifelong community advocate, I know they are on to something. Each of us is only as healthy as the communities in which we live and work. We can have millions in the bank, but be individually and communally poor. People who take part in strengthening their communities are often happier. They feel that they are part of something larger, and that by putting something in, they are getting something greater in return. One of those people is Don Trevarthen from Minnesota. Don worked for more than 25 years as a lawyer for Toro and is a long-time supporter of Greater Twin Cities United Way (GTCUW). He led Toro’s United Way Leadership Giving Campaign for four years, and pledges grew each year. Upon retirement, Don continued his community work by mentoring up-and-coming community leaders, teaching part-time at the University of Minnesota law school, and supporting various GTCUW projects. Don, who GTCUW said “has changed our Twin Cities community for the better,“ believes in the power of purpose and community to change lives. It’s also clear that he feels a sense of achievement from supporting his community. During my career, I’ve met an untold number of people like Don who have made amazing individual contributions to their communities’ socioeconomic health. By redefining success to include personal safety, financial security, sense of purpose and community connections, as well as by embracing the power of digital technology, I believe our communities will be ripe for the kind of social progress fought for by Don and so many others. Mayor Allen Joines and N.C. Rep. Derwin L. Montgomery today announced formation of The Partnership for Prosperity, a new non-profit initiative that will work to implement the recommendations of the Poverty Thought Force. The partnership will work to create and implement an action plan for reducing the number of city residents affected by poverty. It will be guided by the recommendations of the Poverty Thought Force, formed by Joines and Montgomery in 2015 and tasked with finding local solutions that would be both impactful and feasible for reducing poverty. After studying the issue for 15 months, the thought force members came up with 56 recommendations and suggested that the community designate a person to work on this effort full-time. Accordingly, The Partnership for Prosperity will have an executive director and a community engagement associate, both of whom will work full-time, Joines said. John Railey, the former editorial page editor of the Winston-Salem Journal, will serve as the partnership’s executive director. Chanel Nestor, an adjunct lecturer of Rural Sociology and Sociology at N.C. A&T State University and a Winston-Salem native who grew up in the Happy Hill neighborhood, will serve as the community engagement associate. Support for the partnership is being provided by the city, BB&T, the Z. Smith Reynolds Foundation, the Kate B. Reynolds Charitable Trust, Goodwill Industries of Northwest North Carolina, the United Way of Forsyth County and Wake Forest University. As an initial step, the partnership will hold a series of “listening sessions” with those who are living in poverty. The meetings are open to the public and will solicit input on the Poverty Thought Force recommendations and which of them the partnership should focus on implementing. · Monday, April 1, 1 p.m., Financial Pathways of the Piedmont, 7820 North Point Blvd., Suite 100. · Thursday, April 4, 1 p.m., Cleveland Homes Community Center, 1135 E. 15th St.
· Thursday, April 4, 6 p.m., Skyline Village, 1528 Bruce St.
· Friday, April 5, 2:30 p.m., The Community Mosque of Winston-Salem, 1419 Waughtown St.
· Monday, April 8, 2 p.m., (Meeting of The Homeless Caucus) Central Library auditorium, 660 W. Fifth St.
· Wednesday, April 10, 1:30 p.m., Crisis Control Ministry, 200 10th St. E.
· Thursday, April 11, 6 p.m., Emmanuel Baptist Church, 1075 Shalimar Drive. · Wednesday, April 24, 1:30 p.m., Lloyd Presbyterian Church, 748 N. Chestnut St.
· Wednesday, April 24, 8 p.m., Open Arms Community of the United Methodist Church, 437 E. Sprague St.
· Thursday, April 25, 2 p.m., Experiment in Self-Reliance, 3480 Dominion St. NE. Mayor Allen Joines will hold a news conference at 11 a.m. Friday, March 15, to announce the formation of a follow-up organization that will carry on the work of the Poverty Thought Force, and introduce its leaders. Speakers will include Joines, N.C. Rep. Derwin L. Montgomery and representatives from sponsoring organizations. The news conference will be held in the City Hall Council Chamber, 101 N. Main St., Winston-Salem. Joines, along with Montgomery and Rogan Kersh, the provost of Wake Forest University, announced the formation of the Poverty Thought Force in October 2015 and asked its 22 members to find local solutions for reducing poverty that would be both impactful and feasible. The thought force members delivered their final report in February 2017, which included 56 recommendations. The final report is posted at PovertyThoughtForce.com. As a widow and living alone, Betty didn’t have any support in place when she was diagnosed with Stage II cancer in August of 2017 at the age of 60. She underwent chemotherapy and radiation. Unfortunately, because of her diagnosis she had to stop work as a custodial worker and she was without income during her treatment , as well as becoming uninsured. Family support was very limited. Our United Way funded partner Cancer Services, Inc. was been able to assist her with the cost of her medications, nutrition, purchasing medical supplies and providing transportation to her treatments. Due to her having no income, the United Way of Forsyth County was able to assist her in finding outside resources to help her with rent and utilities while she was applying for Social Security benefits, which meant she was able to remain in her home. This transitional support allowed Betty to focus on her treatment and create a more manageable life while being out of work and not worrying about bankruptcy and greater debt. For cancer patients, psychological stress adds to the burden imposed by the disease and the sometimes difficult aspects of treatment; United Way was able, with your support, to remove those barriers so Betty could focus on bating her cancer. Winston Salem, NC – Reynolds American, Inc (Manufacturing 2501-5000 Employees), BB&T, (Financial/Banking Institution 2501-5000 Employees), HanesBrands (Retail 1501-2500 Employees and Inmar, Inc (Professional Services 501-1000 Employees) have each been awarded the annual Spirit of NC Award. On a yearly basis, United Way of North Carolina recognizes organizations that have succeeded in raising funds to support their community and have dedicated themselves to being part of the long-term solution to build stronger communities. Judges from across North Carolina reviewed more than 50 applications to select winners who were honored in Pinehurst at the Spirit of North Carolina Award Lunch on February 13. The Joel and Claudette Weston Award has honored and recognized leadership and excellence in nonprofit management at local organizations for more than 30 years. Joel A. Weston, Jr. was a senior executive at the Hanes Companies and an active member of the Winston-Salem community. He served as president of the United Way of Forsyth County Board from 1980-1982. Joel believed strongly that nonprofit organizations should be well run and efficient and he introduced many innovative programs designed to strengthen charitable organizations and the community. He passed away unexpectedly in 1984. The Weston Award Endowment was founded in 1985 at The Winston-Salem Foundation by family and friends of Joel A. Weston as a way to honor his vision and dedication to the community. In 1985 the Weston Award for Nonprofit Excellence was established to recognize local human service agencies that are performing at peak efficiency. Today, Joel’s widow, Claudette Weston, continues the family tradition of community involvement and philanthropy through her efforts on numerous boards and organizations and as a member of the Weston Award Committee. What is The Weston Award for Excellence in Nonprofit Management? Every other year any nonprofit agency in Forsyth County can submit an application to win the Weston Award for Nonprofit Excellence. An agency that wins the award must wait five years to apply again. The application is a rigorous evaluation of all aspects of nonprofit management: financial and personnel management, program development and effectiveness, long range planning, marketing, fund-raising, board development, etc. All applications are reviewed by a 16 member Weston Award committee. In addition, the committee hears an oral presentation by representatives of each applicant agency. Site visits are included in the review process if necessary. The winner is presented with the prestigious and much coveted bi-annual award, and beginning in 2019, a grant award to the organization of $50,000. What does the Weston Award Accomplish? The Weston Award recognizes, affirms, encourages and financially supports the best- run charitable organization in Forsyth County as selected every other year by the Weston Award Committee. The Award is a comprehensive evaluation of all aspects of nonprofit management. In filling out the award application, nonprofit organizations can assess and receive feedback on how their agency measures up against best practices in human service agency management. The award promotes efficiency, competence, fiscal integrity, innovation and program effectiveness. Nonprofit management excellence in turn equates to a community that can better help its most vulnerable citizens, maximize philanthropy and enhance quality of life for all. “Joel and I always believed in giving back to the community. The spirit of this award is to honor non-profits or social services organizations that enhance lives, but do so with the most efficiency,” said Claudette Weston. Equity is the lens through which we get the clearest picture of how to combat injustice. This requires empathizing with those experiencing an injustice, setting aside our own thoughts on the matter and living with their perspective. My volunteer experience with A Wider Circle on Martin Luther King Jr. Day in 2018 was a great reminder of this process. I was assigned to measure and sort business suits that had been donated to the Bethesda-based charity’s workforce development program. To my surprise, two hours into my group’s four-hour shift, we hadn’t done a single thing. As it turns out, this was intentional. Instead of getting right to work, a volunteer coordinator spent the first half of our shift getting to know my group and teaching us about the organization. A Wider Circle uses a holistic approach to ending poverty. Its CEO, Mark Bergel, sleeps on the floor or a couch every night to try to understand one of the greatest needs of his clients: a lack of mattresses. We toured the donation processing facility, where only high-quality furniture is accepted. At A Wider Circle, if they wouldn’t gift a donation to a family member, they won’t give it to their clients. 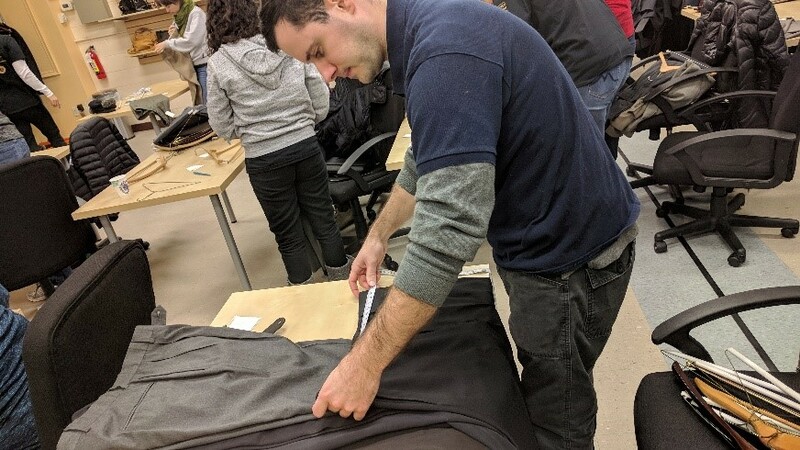 We also learned that each person looking for a job gets five business suits free of charge because no one should have to wear the same work clothes twice in one week. You may think a two-hour orientation was a waste of time. After all, we were there to serve—not be served. However, it created the space for us to try to have a deeper understanding and compassion for the organization’s clients. While sorting and measuring each business suit, I imagined the person receiving it, and whether or not the quality was something I would be proud to wear. Equity is impossible to accomplish without empathy. In 1994, congress established MLK Day as a national day of service to honor Martin Luther King Jr.’s fight for eradicating racist policies that plagued people of color in the United States. MLK was a champion of equity, and a master at empathizing with others to understand and vocalize their needs. There’s a simple exercise in empathy you can do with others or by yourself. Imagine that a volunteer is coming into your home to cook you a meal. What would be going through your head. Would you be nervous? How would you like the volunteer to treat you? How would they know what kind of food you like to eat? This year United Way of Forsyth County, in observance of the MLK Day of Service is partnering with Second Harvest Food Bank for a canned food drive to help support the increased need for food in light of the Government Shutdown. Beginning January 21 and going through Friday January 25th from 8:30-5:00 pm each day the United Way of Forsyth County will be collecting canned foods at their office at 301 N. Main Street, Winston Tower, 17th tower. Cindy Gordineer, President and CEO notes, “We know that many of the projects started on the Day of Service engage volunteers beyond the holiday and impact our community year-round . In light of the increased need for food, we hope this project will give additional support to our partners at Second Harvest”. For more information contact Tahja Gaymon, Engagement Manager, tahja.gaymon@uwforsyth.org. In NC, some 34,000 civilian federal workers did not receive their paychecks and we also know that here will also be a trickledown effect on other industries relying on federal workers right here in NC. Most of these impacted families and individuals have most likely never asked for help before and may be reaching out to local agencies or NC 2-1-1. United Way’s 2-1-1 is a resource for federal workers impacted by the shutdown. Information has been posted at 211.org and shared via media, including this story on Business Newswire, https://www.businesswire.com/…/United-Worldwide-Launches-%E…. NC 2-1-1 call specialists have information about national resources being shared at http://211.org/services/govshutdown as well as a wealth of other local resources within the 2-1-1 resource database. Specific to Supplemental Nutrition Assistance Program benefits, beginning Monday January 14th, the NC 2-1-1 system will include automated messaging for callers regarding SNAP (messaging provided by DHHS). “As a result of the Federal Government Shutdown, the USDA will issue Food and Nutrition Services Benefits for February 2019 early.